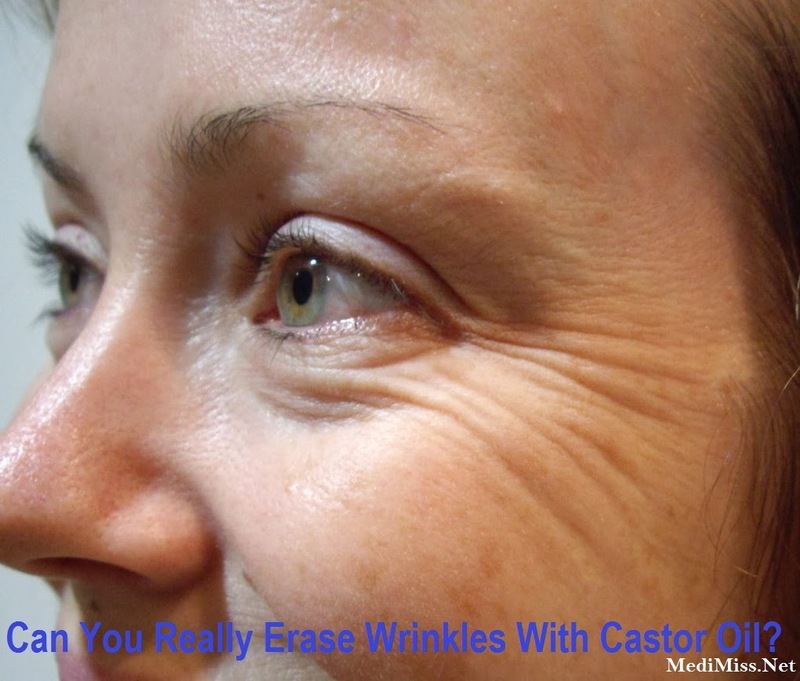 MediMiss anti aging Anti-age Anti-aging anti-aging skin care castor oil erase wrinkles face Wrinkles Home Remedies Natural Remedies Remedies Skin Care wrinkles Wrinkles and Lines Can You Really Erase Wrinkles With Castor Oil? Many people faced with the problem of wrinkles join the search for the best wrinkle treatment each day. Growing numbers of health and beauty conscious men and women are looking for the right treatment to help reduce and remove their wrinkles that are brought on by aging, stress and dry skin. They often have a hard time choosing from the many hundreds of available treatments for wrinkles, from creams to oils to injections. Of the many anti-wrinkle treatments that are available commercially, many are formulated using a combination of natural ingredients and synthetic substances. These treatments are often viewed as being unnatural as they contain artificial ingredients and some people are unwilling to use such treatments. They prefer to use natural treatments instead. One of these natural treatments that is worth considering is the use of castor oil as an anti-wrinkle treatment. Castor oil, which is produced from the seed of the castor plant, is usually taken as a health supplement. However, many people do not realize that it can be an effective form of wrinkle treatment as well. By simply applying castor oil to your skin, you help to soothe your skin, restoring its natural youthful appearance and helping to diminish unsightly wrinkles. One of the properties of castor oil that makes it an effective form of anti-wrinkle treatment is that it is very effective at moisturizing your skin. Castor oil has many antioxidant properties and helps defend your skin against oxidizing agents. It also cleanses and heals your skin even as it hydrates your skin. Also, castor oil does not leave an oily feeling on your skin after you use it. Simply wash it off with some warm water or even some gentle facial cleanser and it will leave your skin feeling smooth and supple. People with dry skin will benefit greatly from the application of castor oil to areas of the skin affected by wrinkles. Castor oil also helps increase the flow of blood to the skin that it is applied to. Increased blood flow means that the skin receives more nutrients and oxygen, making skin healthier and fuller, helping to erase wrinkles and fine lines. Even heavy wrinkles respond well to the increased circulation of blood and lessen or fade. Many people who use castor oil on their skin on a regular basis report that the treatment leaves them feeling younger and their skin looking healthier. Castor oil also has a positive effect on wrinkles and fine lines, reducing the severity of wrinkling and also giving skin a natural healthy glow. While it must be said that no treatment available today can completely eliminate wrinkles, regular treatment with castor oil will help to keep wrinkles at bay, and to help reduce the formation of wrinkles, keeping you looking younger, longer.